isavirtue: make art a part (of your life) e-course | hello out there! make art a part (of your life) e-course | hello out there! hello out there! i guess everyone is on summer vacation. this is my first year really participating in the land of blogs and i didn't know that summer was going to be such a dead zone! that's difficult for me because i find it to be a very inspiring time. the weather, the scenery, the events...it makes me feel so creative and excited about life! 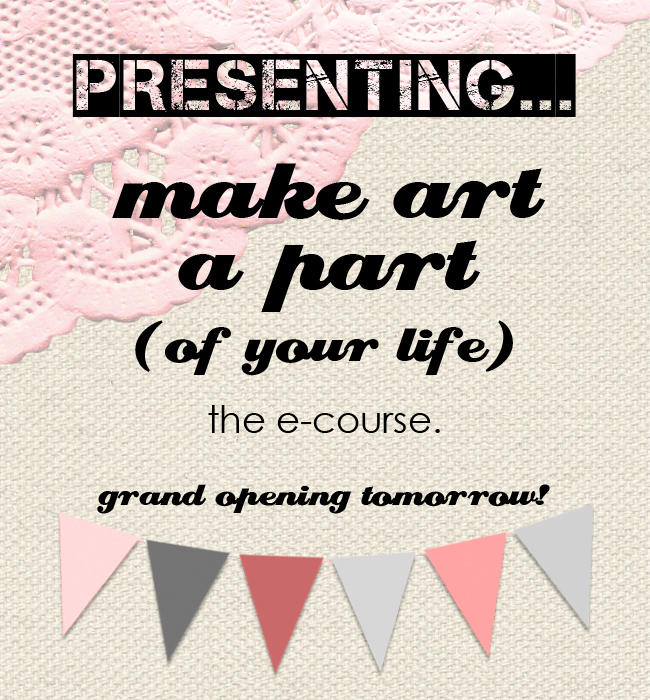 well, i hope there are still some people out there because tomorrow is the launch of my make art a part (of your life)" e-course! it's turned out to be something i'm quite proud of. i asked a friend for some feedback yesterday and was really pleased with her response. she came away from it more informed and with the message i intended to share. pre-registration is now open. you can register at any time but invites will be sent out beginning august fourth. And btw, I'm here! The weather is so unbearably hot & humid right now, that I'm doing all I can to stay indoors unless absolutely necessary. This looks fab - I'm terrible for jumping around from craft to craft so this course suits me perfectly! That's why I've just registered! Yay!